Flower boxes can brighten and improve your home with a floral face lift! Buying or Building flower boxes that will last for decades “Will” save you time, money, effort and stress in the long run. Please read this before purchasing or building your flower boxes to ensure that you buy or build the best boxes for your situation. There are several different types of window boxes. They are made from various materials like metal, plastic, wood, stone and fiberglass. If you would like your window boxes to last for decades then you must choose to buy or make window boxes from the most rot and insect resistant material available. Cedar will rot when directly exposed to dirt and moisture. If using cedar for the sides, you may want to use pressure treated lumber for the bottom and a container to keep the soil and moisture from touching the cedar sides in order to prevent rot. Pressure treated lumber is recommended for exterior use. Thick Composite plastic material is good to use but few if any window boxes seem to be made with this material. One major problem with plastic is that the anchor points or “attachment points” (where the box is attached to the house) can break from weathering &/or pressure from the weight of wet soil. Plastic can also bend out of shape when heated by the sun. Make certain that the window box support brackets will support the weight of the window box with wet soil. Use attachments that will not damage your house. Some flower boxes come with attachments but the type of attachment (support) used is dependent upon the material that your house is sided with (that which the box will attach to). Make certain that the window box is the appropriate style for your home. The box can be painted to match your home but the style should match your home so a custom window box may be required to get the look that you desire. Custom window boxes and plans are available upon email request. We recommend that consumers read the “Build your own” chapter before searching the internet so that they will be able to compare both prices as well as the quality of the window boxes. Step 1. Buy plans for the window boxes that you would like to install and build them yourself. Make sure that the plans are for a window box size that matches the size of your windows. You can find window box plans in several places but you can also email Master Carpenter James C. Thomas for a free price quote. Include the size of your window or windows (if different) by measuring the opening across the bottom from inside to inside. 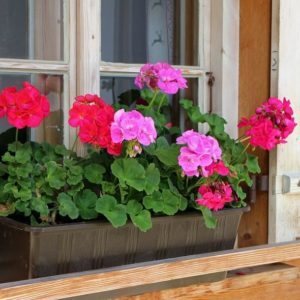 If you plan to build the window boxes yourself and you plan to use plastic container inserts, you might want to buy the inserts first and design your window boxes large enough for the inserts to be slipped in and out easily (to change the soil or plants from time to time). This can be especially useful for second story window boxes. Step 2. Acquire the tools necessary. If you are renting your tools, you should wait and rent your tools after your materials are in place and ready. You will need a circular saw or miter (chop) saw to cut your boards. A jig saw is a handy tool but may not be necessary unless you cut curves or can not use the other two saws. You can use a trim gun & air compressor, hammer & galvanized nails, or a drill with a screw driver bit attachment and galvanized screws, to assemble the boxes. You will need a tape measure, speed square and pencil. If you plan to paint the boxes then you will also need silicone base adhesive calk (about one tube for each box), primer (one gallon), paint (one gallon) and a paint brush. A hand sander is also needed unless you plan to do the sanding by hand. Step 3. Acquire the materials necessary. We suggest using 4.0 pressure treated lumber (not pressure treated plywood). Pressure treated lumber must be dried before painting. Just leave it outdoors in the sun until dry (after constructing the boxes but before calking & painting the boxes). Extreme heat (direct sun in hot climates) may cause the lumber to dry out too fast so drying out of direct sunlight is suggested. You should use gloves when handling wet pressure treated lumber because the chemicals used to treat the lumber should not be exposed to bare skin. Plastic or rubber trim is also suggested and can be purchased at your local home improvement store or lumber store. Step 7. The inside and outside corners and cracks of the box should be calked with silicone based – adhesive – “paintable calk” for exterior use. Shoot calk up into the cracks to fill them thoroughly. This will not only seal the corners but it will secure the corners since the calk is an adhesive! The window box should be primed with something like kiltz “water based” primer and then painted thoroughly. Paint your window boxes each time that you paint your house. Check with your local home improvement store for anchors to attach the box to your house. The window box should be attached in a way that does not do damage to the house in any way including trapping water against the house or leaking into your house. Elite Carpentry Window Boxes include the necessary drainage away from the house and the proper attachments.